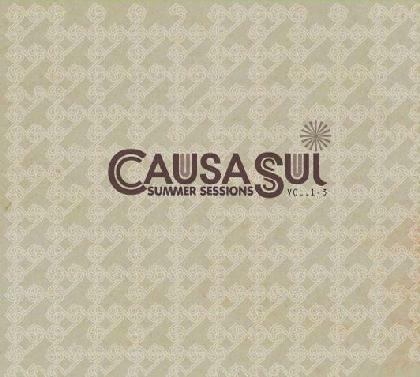 Causa Sui - "Summer Sessions Vol. 1 - 3"
Causa Sui are a Danish band that experiment with space rock/stoner styled improvisations until the cows come home and go back out again. Summer Sessions is a 3 CD set jam packed with classic pieces of totally instrumental mood changes, re-released on CD after the initial vinyl runs went like hot cakes. Volume One is a four track CD lasting around 45 minutes. It flows in an experimental mould, journeying through phases of mellow and heavy respectively and giving the listener an instant insight to why the band have had nods by the likes of Julian Cope and Rolling Stone editor David Fricke. The sound is psychedelic and it would appeal to those who like a bit of movement to their music, very much in the same place as the likes of Can or latter day Soft Machine, taking this genre and expanding on it to make it their own. Volume Two is a five track CD lasting around the 45 minute mark. This also flows in an experimental mould, very much in the same place as Electric Orange. The opening track Sun Prayer is a mellow acoustic intro of just over a minute, which is blown wide by track two Rip Tide, which has a Manic Depression feel about it, taking the Hendrix style and mixing it with a Soft Machine saxophone edge. It has a total manic styled jam sound and this seems to carry on throughout the rest of this volume, with subtle differences along the way. Volume Three is a five track CD lasting around 33 minutes. Track one, Eugenie, starts out with a mellow saxophone, keyboard piece, very much in the vein of Soft Machine. The journey continues in the same fashion through track two, Red Valley, leaning to the more mellow side of the band, which continues throughout the rest of the CD. On the whole the 3 volumes are excellent pieces of work. They take the experimental form and incorporate a meld of Can, Soft Machine, Jimi Hendrix, Electric Orange and a host of other explorers of the psychedelic under their wings to produce something that sits very nicely in the improvisational as its main genre. The bio states file under Space Rock/Psyhchedelic/Stoner/Jam and it is for fans of Jimi Hendrix/Hawkwind/Pink Floyd/Motorpsycho and Can, and I could not agree more. Summer Sessions Vol. 1 - 3 is a must for everyone who likes a bit of instrumental improvisation and a tad of wild saxophone tooting. Excellent stuff.